This is an easy scarf that is easiest enough for a beginner to crochet. The free scarf pattern is quick and easy to make. This pattern uses an V-stitch with alternating groups of double crochet. It forms somewhat of a block pattern and looks lacy at the same time. Row 1: In the third ch from hook work 1 dc, ch 1, 1 dc (V stitch), * skip 2 ch, 3 dc in next ch, skip 2 ch, V st in next ch. Repeat from * across, ending 1 dc in last ch. Ch 2, turn. Row 2: *Work a V st under ch 1 of V st, 3 dc in center dc of 3 dc group; repeat from *, to ending V st, 1 dc in top of turn ch. Ch 2, turn. Row 3 – 85: Repeat Row until the scarf reaches the desire length. I worked 85 rows for a long scarf. Finish off and work in all ends. Feel free to use the pattern for both home use and to if you’d like to sell the scarf itself. You may link to this pattern, but please do not copy the pattern itself to your site. It is covered by Copyright law and is the property of Barb’s Crochet. 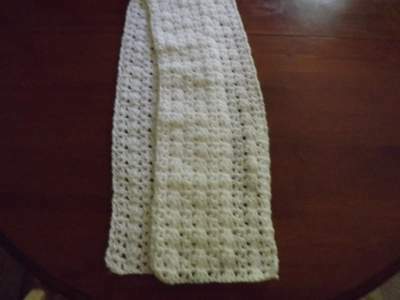 If you enjoyed crocheting this scarf, you might like the V-stitch scarf pattern.